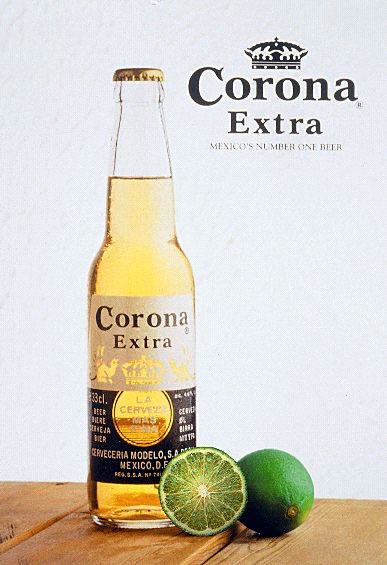 Some years ago, a group of researches studied the formation of lightstruck flavor in beer (Chem. Eur. J. 2001, 4554). They found that isohumulones, compounds contributing to the bitter taste of beer, decomposed when exposed to ultraviolet light. In a recent blogpost, Harold McGee elaborates on this and it turns out that the way this happens is even more complex than first anticipated. The researchers (J. Agric. Food Chem, 2006, 6123) found that riboflavin (vitamin B2) acts as a photosensitizer in beer (and in olive oil, milk and butter) which catalyzes the conversion of oxgyen to a more reactive type of oxygen (singlet oxygen). 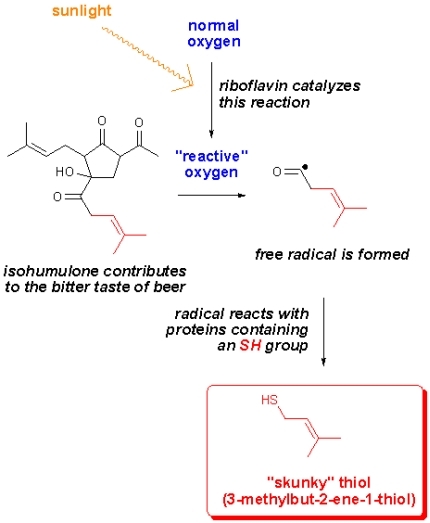 This oxygen then “destroys” isohumulone and in the process radicals are formed. As shown in the figure, the radical reacts with sulfur containing proteins, thereby forming a thiol called 3-methylbut-2-ene-1-thiol or just MBT for short. The amazing thing about this compound is that we can smell it at concentrations as low as a few parts per billion (ppb). The perhaps not-so-amazing thing is that this compound gives beer a “skunky” aroma. Obviously one would want to avoid this, and that’s why beer is sold in dark brown glass bottles that act as the beer’s own sunglasses. Canned beer of course will not go skunky (well not until it’s poured into a glass and served outside in bright sunlight – that will turn any beer skunky within minutes). The take home message is: keep your olive oil, milk, butter and beer away from sunlight!